Ok. Ending the year and thinking back to the many great things that happened in 2011. Oh…., don’t get me wrong; these great moments are only visible upon reflection. It’s only after the fact that we get to see all the great ones in between. So, seems fitting here as I wrap up my thoughts. An ending of a year is Just a beginning of another. So… On page 138 of my recent book, Get Catering and Grow Sales, I listed my commitment to the following 19 discussion papers, each 3 or 4 pages. * watch for competing resources and what to do when that happens. * compensation and bonus plans for catering. * defining a catering vision and customer experience. Ok. There. I started. Maybe I’ll make one of those polls and ask 5000 people what they’d like me to attack first. Or, maybe I’ll just decide. Really enjoyed the book and interested to get your thoughts on these specific questions. Thanks Doug! I am glad you enjoyed my first book. I am planning to publish these essays this year, however, it is a work in process. In the meantime, I would be happy to chat on the phone anytime about these questions if you think it will help you. I know, it would certainly help me to help you! I can be reached anytime at erle@monkeymediasoftware.com and we can exchange times that work for a call. Thank you for your enthusiasm. 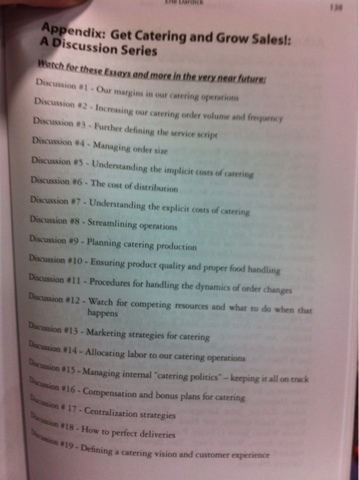 Where did you order your copy of Get Catering and Grow Sales from?